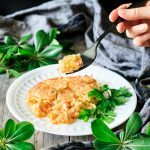 Cheesy corn casserole is a creamy Southern side dish that’s really easy to make from scratch. It’s a delicious Thanksgiving side that is great for kids or a crowd. 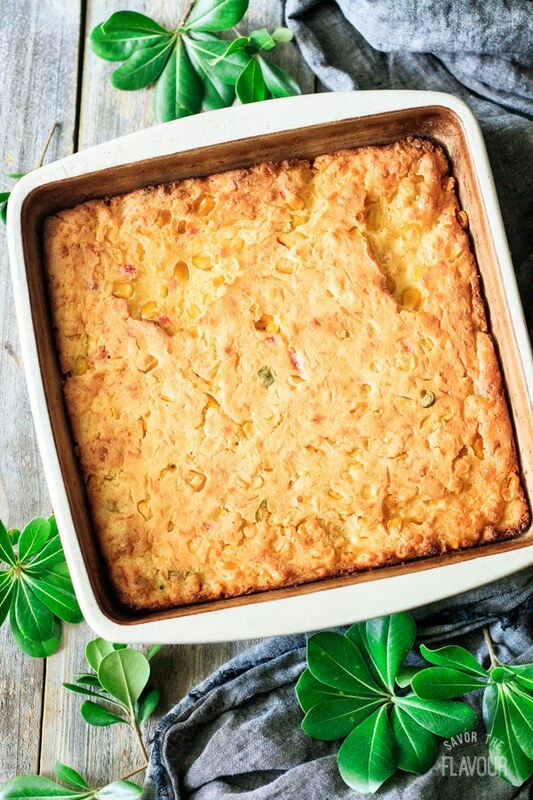 With this recipe, you’ll learn how to make your own homemade cornbread mix, too. Cheesy corn casserole is a vegetable dish that is always popular with a crowd because it appeals to people who love corn. For this version, I added diced pimentos and green onions for color. I only added one cup of grated extra sharp cheddar cheese to let the corn flavor shine through, but you could easily add more if you wanted it to taste more cheesy. Yes! 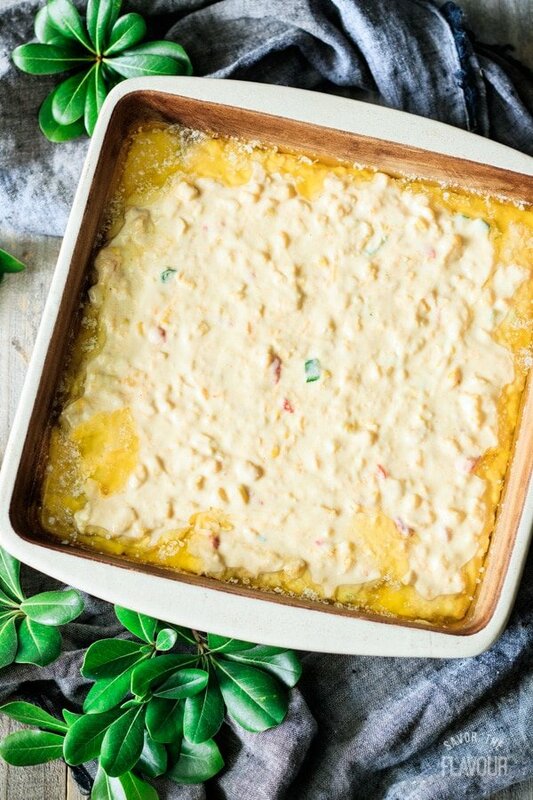 Prepare the corn casserole batter less than 24 hours before baking it, then cover it tightly with cling wrap or foil and refrigerate. Then, you can bake it when you’re ready. Tip: if you’re using a stone baking dish like I did, take it out of the fridge 30 minutes before baking so the dish can warm up a bit. Part of the popularity of this recipe is that it can be easily adapted to please almost anyone’s taste preferences. Check under the pro tips section to find variations of this recipe depending on your mood, or handy tricks if you’re making it as a covered dish for a celebration. 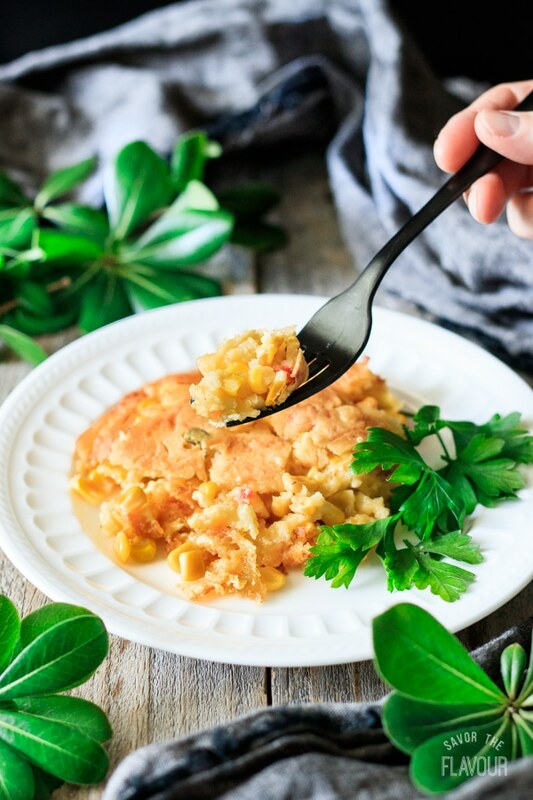 Can you freeze corn casserole? Yes, you can! Wrap the casserole in a double layers of aluminum foil and store in an airtight container. Just make sure it’s chilled before you freeze it to prevent ice crystals from forming. It should be fine in the freezer for 3 to 4 months. Make sure you label and date the dish. When ready to use, let it thaw in the fridge overnight. Prep all the ingredients. Grate the cheese, dice the pimentos, and slice the green onions. 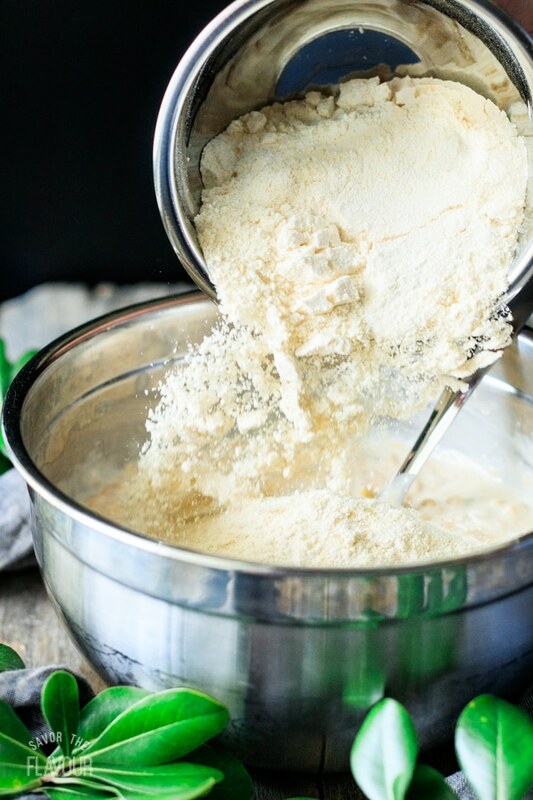 Pour the five dry ingredients in a bowl and whisk together until well combined. 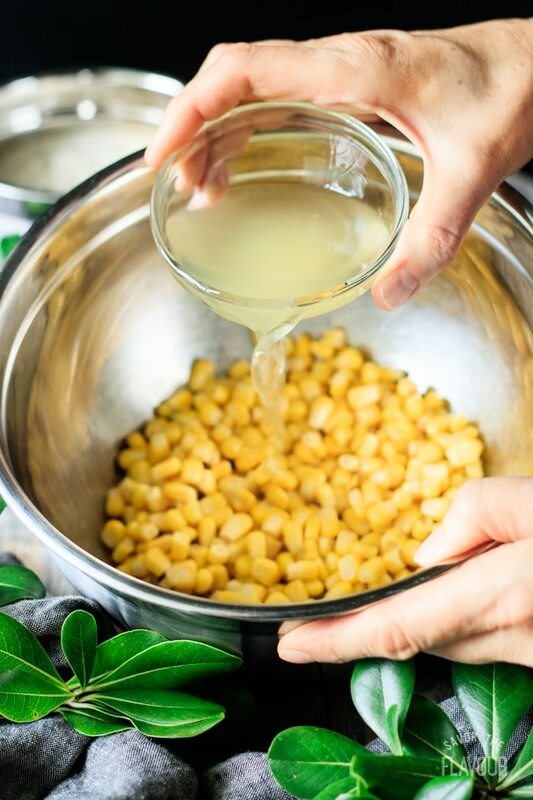 In a separate bowl, dump in the can of corn kernels and half of its liquid. 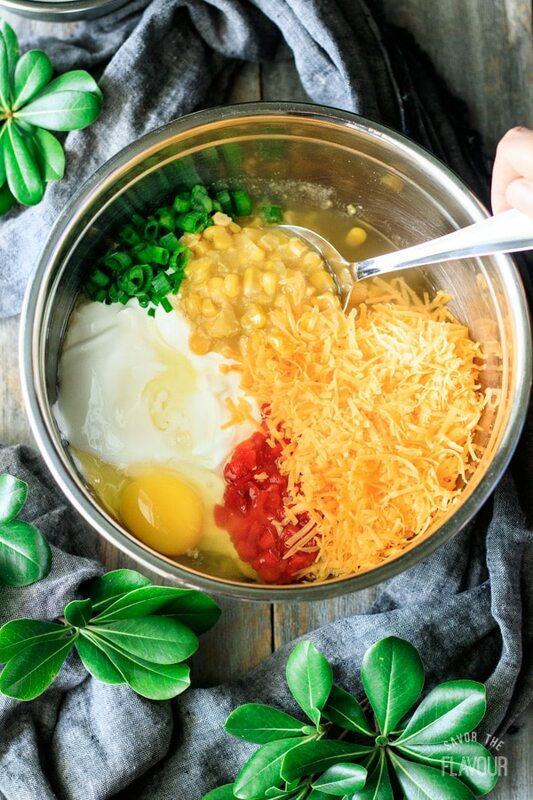 Next, add the rest of the wet ingredients into the bowl of corn and mix well. With a large spoon, stir well to combine. Preheat the oven to 350 F. Let the corn batter rest for 5 minutes for a lighter texture and a higher rise. Put a stick of cold salted butter in a 9×9-inch pan and let it melt in the oven. Once it’s melted, take the dish out. Spoon the corn mixture over top of the hot, melted butter. Be careful not to burn yourself. Now, it’s ready to bake for 1 hour and 10 minutes, but to be on the safe side, check it 5 or 10 minutes before the timer beeps. When the top is golden brown with a few cracks and a toothpick poked in the middle comes out clean, it’s done. 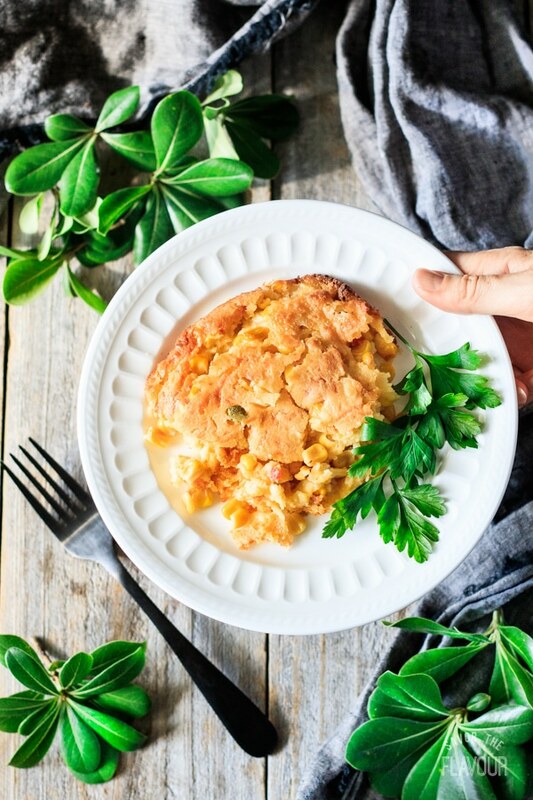 Busy Baker is a purist and loves the creaminess of the classic version of corn casserole, but that’s because she loves the taste of creamed corn. I, on the other hand, don’t like creamed corn, so I try to mask the taste of it by adding other things into this dish. 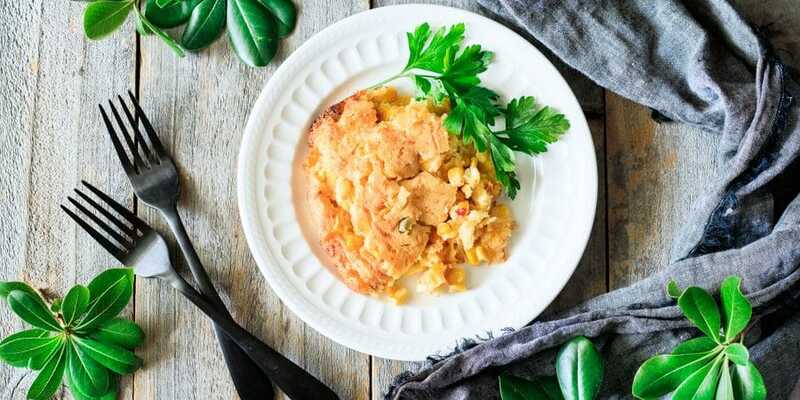 Since this dish is popular in the South, it isn’t surprising to find out that it’s served on many dinner tables at Thanksgiving. This recipe is so simple to make that your kids can get involved! Skip the boxed cornbread mix, and make your own. It’s easy! Want it plain? Leave out the add-ins and the corn flavor will shine through. Substitute the canned corn with fresh or frozen corn. Want a sweet version? Add an additional 4 tablespoons of granulated sugar, one at a time. Need to substitute the sour cream? Try French onion dip. 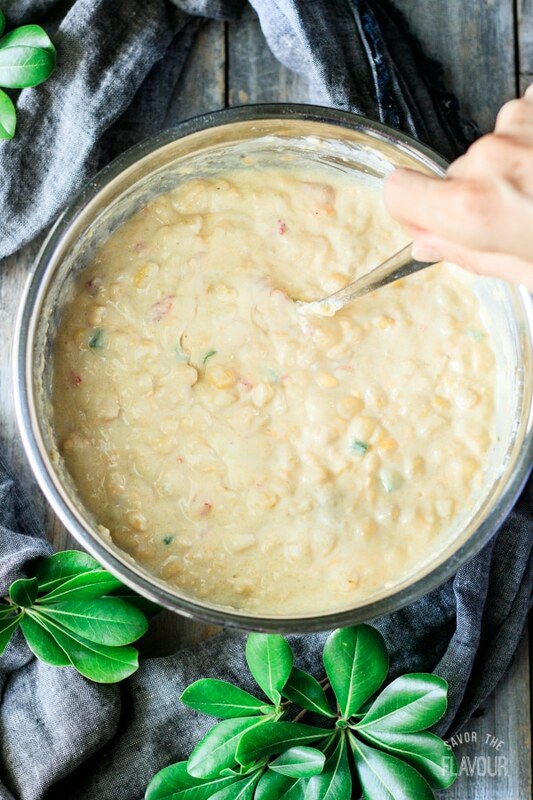 For a lighter texture and a higher rise, let the corn batter rest for 5 minutes before baking. Want to add meat? Try cooked and crumbled sausage, bacon, or diced ham. Want it spicy? Add diced chilies or jalapeño peppers. 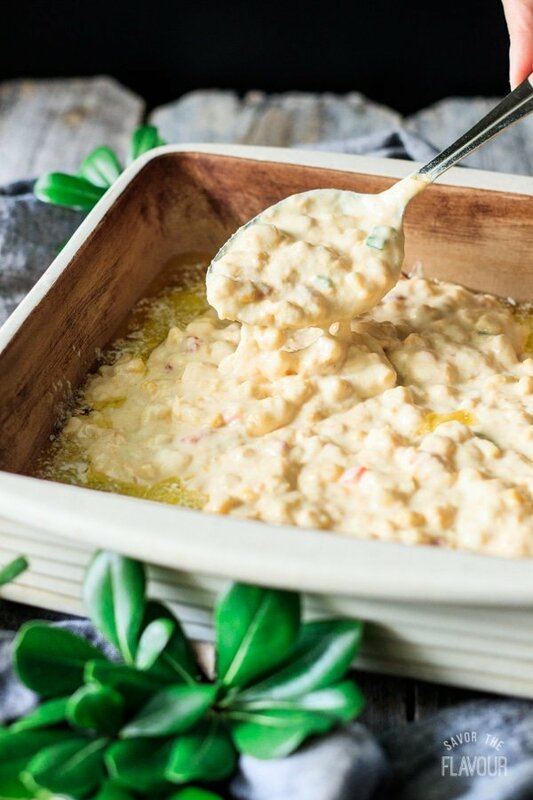 These other Thanksgiving side dishes will make your dinner one to remember. Bacon and Walnut Green Beans: a healthy and flavorful twist on the classic green bean casserole. 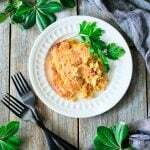 Best Sour Cream Mashed Potatoes: you won’t believe how creamy and tangy these mashed potatoes are. 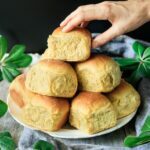 How to Make Fluffy Dinner Rolls: these soft and fluffy rolls can be made ahead. 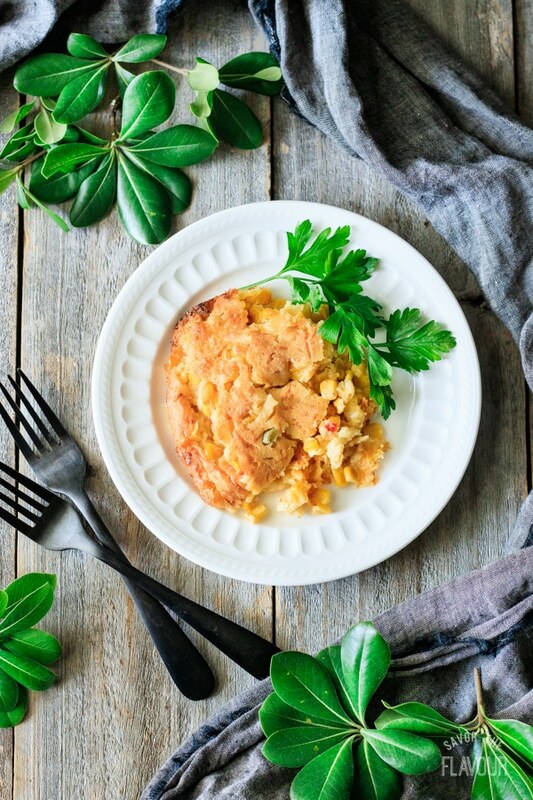 Share your thoughts on this cheesy corn casserole recipe by leaving a recipe rating below. 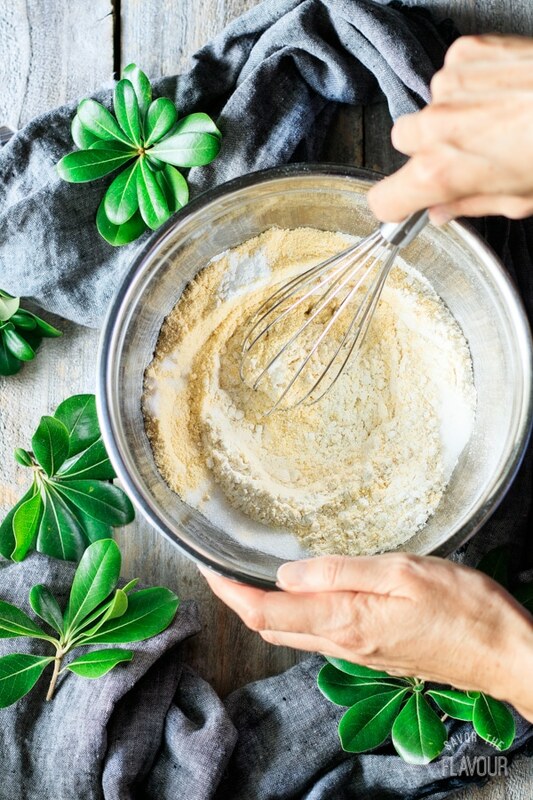 Stir together the flour, cornmeal, sugar, baking powder and salt in a medium sized bowl. Make sure it’s well mixed. 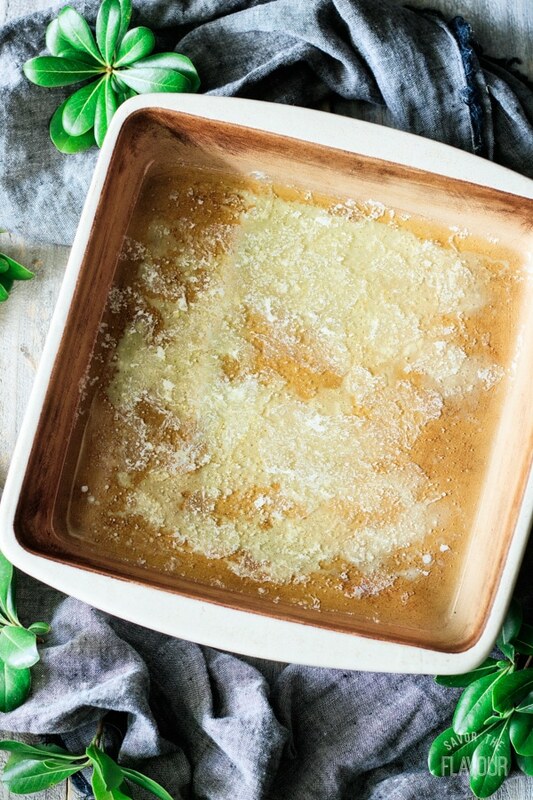 Put the butter in a 9×9-inch casserole dish, and let it melt in the oven. Once melted, take the dish out of the oven. Dump the can of whole kernel corn and half of its liquid into a medium-sized bowl. 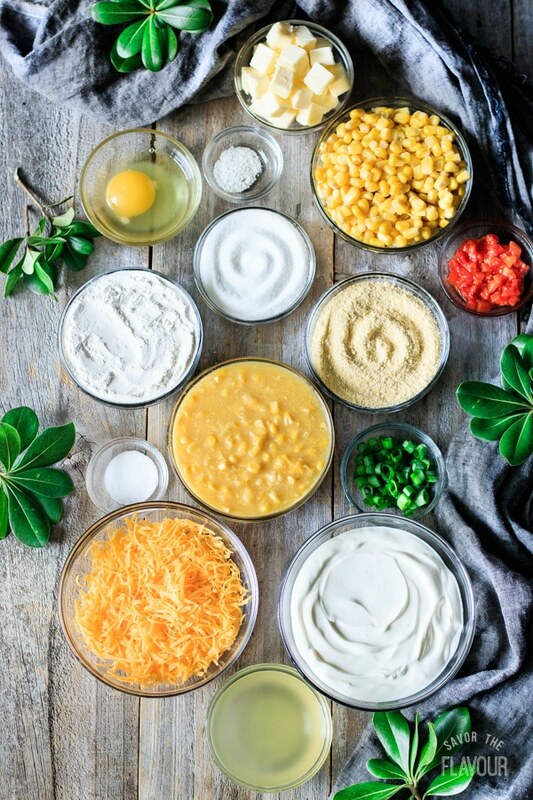 Add the creamed corn, sour cream, shredded cheese, pimentos, and green onion and mix well. Add all the dry ingredients to the wet ingredients and stir well to combine. If desired, let the corn batter sit for 5 minutes in the bowl for a lighter texture and a higher rise. Pour all the ingredients into the hot, buttered casserole dish. Be careful, as the dish is still hot. Bake for 1 hour, then check to see if it’s done. It may need another 10 minutes. It will be done when it has a golden brown, cracked top, and a toothpick inserted into the center comes out clean. Serve warm. Looking for other suggestions for adding color? Try diced red, yellow, and orange sweet peppers or cilantro.